In an ideal world, we would all have the space and budget to splurge on the sofa of our dreams—one that marries comfort and style with a design-forward sensibility. In reality, finding the perfect sofa is difficult enough as it is without having to factor in size and affordability. When it comes down to it, we’re often forced to compromise on one or the either, having to forgo a crucial decorative detail in favor of the price tag. That’s where we come in. If you find yourself at a loss for sourcing the perfect sofa—i.e. one that fits in your apartment or small space and doesn’t require taking out a second mortgage—allow us to step in with a few helpful suggestions. We set out to find the most comfortable and inexpensive couches that don’t skimp on style and can cater to a variety of decorative preferences. Whether you live in a tiny city apartment or have some serious square footage at your disposal, the finds ahead are sure to inspire. Read on for the inexpensive couches that only look like they’re budget. This mod sofa is built to withstand all that comes with kids, pets, and parties—and the chic midnight-blue upholstery gets yet another point for durability. With its classic form, this sofa marries contemporary style with a touch of elegance. Clean lines, curved accents by way of the lumbar pillows, and deep, cozy cushions offer maximum comfort. For the urban dweller whose style skews between ultra-mod and industrial, this design is set on a steel frame with mesh fabric detailing, promising plenty of springy support. A sofa with warm wood detailing and textured linen-blend upholstery is always a keeper. Urban’s Peyton model fits in just about every decor scheme—including this calming minimalist space of our dreams. 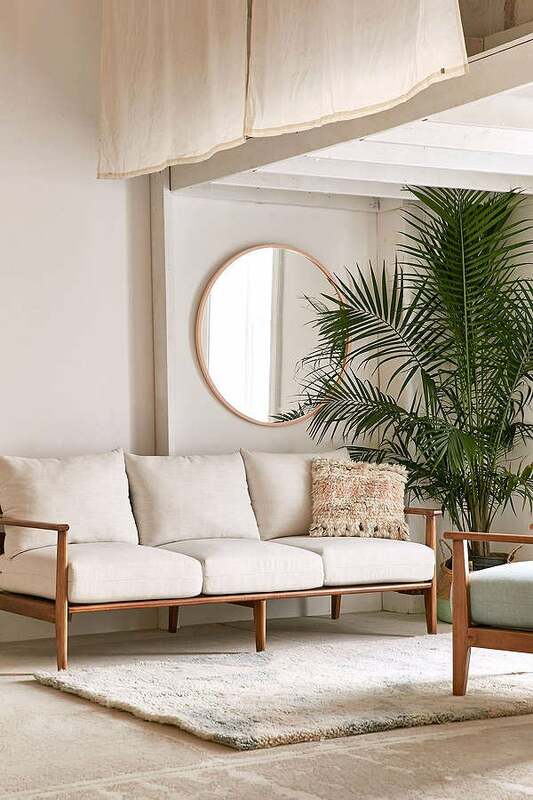 Ikea’s Soderhamn series boasts a handful of our favorite sofas and loveseats that offer Scandinavian style for less. This particular model features a deep, low seat that’s very of-the-moment. Need something with a bit more structure? The Samsta sofa has a similar look but with arms—and comes in a seriously covet-worthy pink colorway. A sofa as luxe as this hardly ever comes with a price tag like that. From its velvet-like finish to the rich, emerald green hue, this piece exudes pure elegance. In other words, it’s the statement piece your living room was missing. Classic mid-century modern in a timeless shade of gray is the workhorse of a living room. Layer on colorful throws and pillows to make it your own. From its clean silhouette to its perfectly peach-pink hue, this sofa is just the right amount of retro. Need further convincing? Its LiveSmart upholstery tech creates a moisture-resistant barrier, which means stains and spills can be blotted away in a snap. Leave it to the Novogratzs to design such a stylish seat for such an affordable price. Featuring linen upholstery and slanted oak legs, this sofa has all the makings of a contemporary statement piece. A sleeper sofa (under $300!) as style-focused as this? It sounds too good to be true, and yet here we are. The Regal’s split-back is a nice multi-functional detail that allows for versatility, too. Don’t let the streamlined look of this sofa fool you; sitting in it is like being hugged by a cloud. We love how the solid wood trestle legs channel Japanese modernist vibes. So you can splurge on that Noguchi lamp and still be on budget. Scandi-style meets the effortless cool of a mid-century mod aesthetic, with functionality at the design’s core. Target’s Roxy sofa comes with walnut-veneered armrests, adding a dynamic element into the mix. This story was originally published on April 2018. It has been updated with new information.